Josh Gottheimer represents New Jersey’s Fifth Congressional District, which includes 79 towns in Bergen, Passaic, Sussex and Warren Counties. A fighter for lower taxes and Jersey Values, Josh was first elected in 2016. In his first term, Josh has already distinguished himself as a bipartisan leader who believes in working together across party lines to find common ground to get things done. Shortly after he was sworn in, Josh was elected Co-Chair of the Problem Solvers Caucus, a group of 24 Democrats and 24 Republicans who work together to find solutions for our nation’s toughest challenges. Recognizing his efforts, the nonpartisan Lugar Center named Josh the most bipartisan freshman member of Congress. Josh is making a difference by working across the aisle and delivering results for our families. When he got to Congress, Josh quickly began working with local officials to claw back more of our hard earned money. Before Josh took office, the Fifth District got back only $0.33 for every dollar we paid in federal taxes. Meanwhile, Moocher States like Mississippi and Alabama got back as much as $4.38 for every dollar they paid. Already, Josh has helped return 16% more of our tax dollars – that’s $290 per family to help our towns lower property taxes, improve crumbling roads, bridges and tunnels, and provide the equipment first responders need to fight crime and terror. Josh continues to fight back against Moocher States that try to use New Jersey as their personal piggy bank and recently introduced his bipartisan Anti-Moocher Bill. After Congress passed a Tax Hike Bill that took a two-by-four to our state, Josh introduced a Tax Cut Plan and helped lead the charge to reinstate SALT (the State and Local Tax deduction) to help lower the tax burden on New Jersey’s families. Prior to serving in Congress, Josh worked at Ford Motor Company and Microsoft, both companies that harness technology and innovation to create jobs and lead America forward. Based on his work in the private sector, Josh understands that our state is already overtaxed and that we must make it easier for businesses to compete in New Jersey to make our economy grow. Josh was awarded the Spirit of Enterprise Award by the U.S. Chamber of Commerce for his work to bring more jobs and businesses to the District. There is no responsibility that Josh takes more seriously than protecting our families and communities. Josh always has and always will continue to stand up for the veterans and first responders who put their lives on the line for us. The first bill that Josh introduced and passed when he got to Congress helps our veterans secure jobs after they return home. Josh has also made it easier for our nation’s heroes to get the healthcare they need here in the District. For his commitment to our brave men and women in uniform, Josh was one of only two Democrats in the House to have received a perfect legislative score from the National Association of Police Organizations. During his time in Congress, Josh has also introduced legislation to fight Lone-Wolf terrorism at home, stood up to ensure only women and their doctors make decisions about their health care, worked to strengthen our bond with Israel, and fought to protect Medicare and Social Security against attempts to privatize or cut these vital lifelines for our seniors. No matter the challenge, Josh believes that by working together our best days will always be ahead of us – because in America anything is possible if you’re willing to work hard for it. It’s a lesson he learned from his parents growing up in North Caldwell, New Jersey. Josh’s mom was a nursery school teacher. His father started his own business in their basement, and later grew his company in northern New Jersey. At sixteen, Josh took his first job stocking shelves for his dad to start saving for a car. The family business didn’t have an official slogan, but it easily could have been “work hard and give back.” These were the words Josh heard most from his dad. After graduating from West Essex High School, Josh went on to the University of Pennsylvania, became a Thouron Fellow at Oxford, and then paid his way through Harvard Law School. It was during Josh’s freshman year of high school that Senator Frank Lautenberg passed legislation banning smoking on all airplane flights, teaching him that one person could make a difference. It’s also why, in high school, Josh applied to be a Senate page for Senator Lautenberg, his first step in a career in public service that included serving as one of the youngest speechwriters in White House history. Josh was also a senior advisor to the Chair of the U.S. Commission on Civil Rights and later served as Senior Advisor to the Chairman at the Federal Communications Commission (FCC), where he was the first Director of Public-Private Initiatives. Josh later built on his experience at the FCC to help create a not-for-profit organization that partners with wireless companies to bring affordable high-speed Internet access to low-income students in New Jersey to help them compete and win in the era of the digital classroom. In Congress, Josh draws from his private sector experience and the lessons he learned growing up in Jersey and working in his father’s store, to reach across party lines to find common ground on our most pressing issues. By bringing people together, fighting for lower taxes and standing up for Jersey Values, Josh is getting things done for our families and our country. 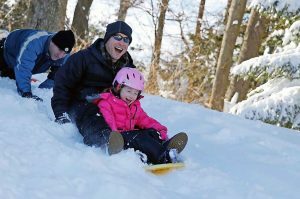 Josh lives in Wyckoff, NJ with his wife, Marla, and their two children, Ellie and Ben. Ellie is in third grade and Ben is in kindergarten and, just like their dad, the highlight of every summer is their family trips to the Jersey Shore. Gottheimer serves on the Financial Services Committee as a member of three key subcommittees including National Security, International Development, and Monetary Policy; Investor Protection, Entrepreneurship, and Capital Markets; and Diversity and Inclusion. Gottheimer is the only Member of the New Jersey delegation serving on the Financial Services Committee.